Blue and white, the colors of Finland. 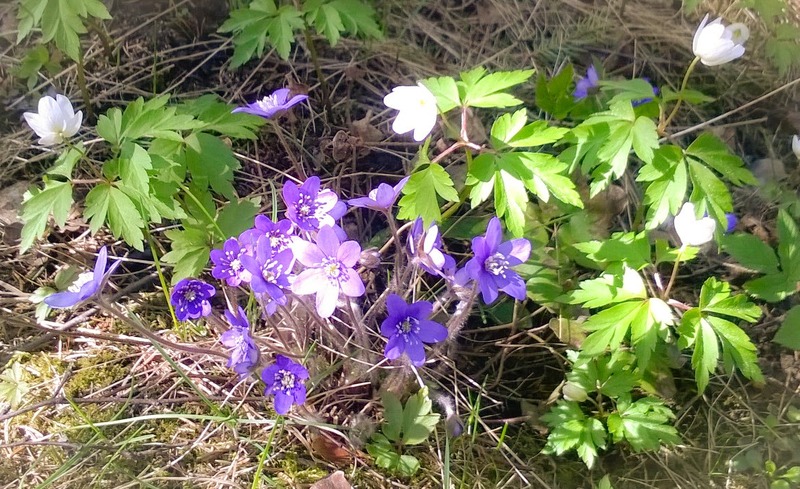 In the spring time, these two colors can be found mingled together in a sea of wood anemonies and liverworts. I have always wanted to live by a forest where liverworts (hepaticas) grow, never before I have, but now we do. It's beautiful! The blooming of liverworts and wood anemonies overlap somewhat. Liverworts are the earlier bloomers of these two. Trees are getting leaves - not my favorite spring sign, the birch just yet, though. Willows are flowering. The other one of our apple trees is pushing buds. Won't be long and it is in full bloom!